During a recent NSW tendering process, we discovered the NSW Government purchasing guidelines actively discourage use of Open Source Software. These guidelines about Open Source Software are dated and need to be changed. Increases the cost and reduce the value of NSW Government IT purchases by actively discouraging use of Open Source. Could the NSW Procurement Team please review the current Open Source statement, assess the appropriateness of updating to Australian Government Policy statements related to Open Source, and reply describing how you plan to address this issue. The NSW IT procurement framework (version 3.1) specifically discourses use of Open Source software with Major Project System Integration Services. (b) it does not insert any Open Source Software into the Customer Environment, except to the extent otherwise approved by the Customer in writing. (b) the use of that Open Source Software will not in any way diminish the Contractor’s obligations under the Contract, including without limitation in relation to any warranties, indemnities or any provisions dealing with the licensing or assignment of Intellectual Property. whole-of-life costs, capability, security, scalability, transferability, support and manageability requirements. 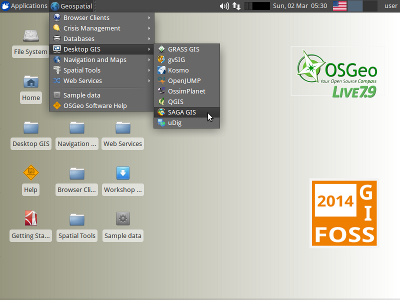 We are starting the build cycle for version 8.5 of the OSGeo-Live DVD/USB/VM which will be released in March 2013, ready for several special events, including FOSS4G-NA, FOSSGIS Germany, among others. Testing to verify everything works in this new system and fixing bugs. Download alpha1 here . Updating version number in your Project Overview (if changed), and possibly mention a new feature or two. Doc howtos . Re-running the Quickstart and ensure each step is still valid, and screenshots match the implementation. Due to our tight timelines, we might need to hide applications which we can't get stablised, tested, or docs updated in time. Please check our current list of open issues  to verify that your project is working as expected. 27 July 2014 Alpha4 released . Please verify all applications work and fix bugs. 03 August 2014 Beta1 release - start taking screen shots with new background. 07 August 2014 Community Testing Sprint (UAT). 07 August 2014 English docs complete. 14 August 2014 Translations complete. 17 August 2014 OSGeo-Live 8.0 sent to the printers. In response to community suggestions in previous years, the OSGeo board has updated the voting process for OSGeo Charter Membership to be more inclusive. In particular, there is now no upper cap on the number of new Charter Members who can be voted in. This will avoid the disappointing situation where we our process denied respected community members from charter membership because we didn't have enough slots. Now, new charter members need only demonstrate positive OSGeo attributes as confirmed by existing Charter Members. The official responsibilities of Charter Members is very light, consisting of voting in the OSGeo Board and other OSGeo Charter members. However, it is also a way we officially acknowledge the number of volunteers who help out in many ways with OSGeo activities. So now the process is updated, I encourage existing Charter Members and community leaders to be proactive about nominating people from their community. If you are ok being nominated, then please email me to let me know. Ideally, can you please also point at your OSGeo Advocate profile which I can reference when nominating you. (You might need to create your profile first). We are starting the build cycle for OSGeo-Live 8.0 which will be released in September 2014, ready for the global FOSS4G conference in Portland. We would like to hear from anyone wishing to add new projects, anyone wishing to extend or add extra translations, or anyone who wants to contribute in code, testing or ideas on how we should shape the upcoming release. Also, could all projects please reply to us with which stable version of their software should be included in this release. Ideally, projects should provide debian packages for this release. OSGeo-Live 8.0 will be built upon the recently released Lubuntu 14.04 Long Term Support release (it was previously based upon Xubuntu 12.04 LTS). Lubuntu, which is a LXDE based Ubuntu linux distribution, is light weight. This means it runs faster, with less memory and disk requirements which will improve the OSGeo-Live user experiences and allow us to fit a little more onto a DVD. Moving to the 14.04 LTS release will help bring all applications up to the latest software, but will likely result in a number of applications needing to apply updates to address new dependency issues. 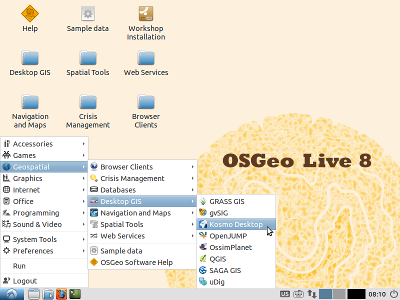 OSGeo-Live is a self-contained bootable DVD, USB thumb drive or Virtual Machine based on Lubuntu, that allows you to try a wide variety of open source geospatial software without installing anything.